LEADING IN: Since 1967, the year Coconino opened and split Flagstaff’s citywide high school population and football talent pool, Flag High had been struggling in Class AAA. This year, the Eagles joined the Panthers in AA, and the results were positive and immediate. Instead of struggling against Phoenix teams like Brophy and Marcos de Niza, they played a largely Northern Arizona schedule, against schools their own size. While Flag High was the new kid on the block, Coconino was the top of the class as defending state champions. The ’73 champs won on the talents of many juniors, including Mark Lescoe, Rick DeCosmo, and their All-Everything quarterback, Ray Smith. Unlike last year, the ’74 Panthers were experienced and expected to win and stay at the top of the polls. That is what they did. They dominated their schedule, and by the time they got to the City Championship Game (for the first time played at the end of the season instead of the start), they were sitting at 8-1, a stunning 7-6 loss to Winslow being their only blemish. Even in losing, Ray Smith stole the show, walking into the Bulldogs’ locker room after the game to congratulate them. At midseason, Coach Bill Epperson shook up the offense by calling up sophomore quarterback Marty McKee from JV, moving Smith to runningback. The move took the Panther offense to a higher level. Without having to call signals, Smith was liberated, breaking school records every game. Against Holbrook he ran 28 times for 187 yards. Versus Tuba City, he only carried the ball six times, but he amassed 152 yards. By the time the Rivalry Game came around, he had 158 rushes for 1,150 yards, breaking his own school record with at least one more game to go. Flag High didn’t get their legs under them until the third game of the season. After losses to Page and Salpointe, they manhandled Bourgade, 24-0, and they took off from there, winning six of seven, going into the finale with a 6-3 record and assured of their first winning season since 1965. Their loss to Snowflake, 25-14 in Week Five, would come back to haunt them by the end of the season. They finished strong, however, beating Winslow (something the top-ranked Panthers couldn’t do) and shutting out Kingman. The Eagles’ offense was led by David Diaz, younger brother of Carlos Diaz (See 1970 Game). Under his talents, the Eagles had their most prolific scoring output in years, scoring 150 points through nine games, their best since their 187 points in 1966. 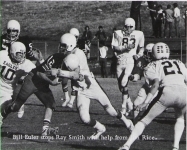 While Smith was a one-man-show running the ball for the Panthers, the Eagles were efficient by committee, as Jeff Crawley, David Anderson, and Kenny Gill combined for over a thousand yards rushing. Their defense, however, won them games; in their six wins, they shut out three opponents and held the other three to under ten points each. After nine weeks, the Coconino Panthers, Flagstaff Eagles, and Snowflake Lobos were all sitting atop the AA North standings with 4-1 division marks. Coconino beat Snowflake, and Snowflake beat Flag High, which meant the Panthers controlled their own destiny; a win over the Eagles would clinch the division and send them to Tempe to play in the state championship game against the South champion. Snowflake needed to beat Holbrook and hope Flag High beat Coconino, while the Eagles were rooting for Holbrook to win to make the City Championship Game a winner-take-all affair. The Lobos beat the Roadrunners Friday night, which meant, by the time the Eagles took the field at Lumberjack Stadium Saturday afternoon, they were eliminated from playoff contention and could only look forward to playing spoiler. THE GAME: Flag High knew they were out of the playoff picture, but they didn’t let down in the first half, playing the Panthers tough. The first quarter was marred by mistakes and missed opportunities. Coconino ran the ball well on the opening series, but the Eagles’ D stiffened and forced a punt. The Eagles were unable to do anything with their first possession and punted it back, first with Smith muffing it and the Eagles recovering (wiped out by penalty), then with Mark Lescoe taking the punt and he and Smith getting their signals crossed, running into each other for no return with no Eagle within ten yards. Another punt, then the Eagles got their offense on track, driving from their 4 to the Panther 30, where Bardo Anaya fumbled and Smith recovered. From there, the Panthers got themselves going, ending the quarter and starting the second with an efficient six-play, 70-yard drive that was capped with Smith going off-tackle for seven yards. With Scott Ross’s extra point, Coconino was up, 7-0. The teams next exchanged turnovers; Lescoe intercepted a Diaz pass and returned it to the Flag High 45, and six plays later, Jeff Crawley intercepted McKee. The Eagles drove to the Coconino 43 and had to punt, which Smith fumbled again, this time with the Eagles recovering and keeping the ball at the Panther 17. Two plays later, Diaz threw a 15-yard strike to David Anderson to put them on the board; Diaz kicked the conversion, and with 3:34 left in the second, the Eagles and Panthers were tied, 7-7. Though the scoreboard showed an even game, the Panthers were racking up the yardage, leading the Eagles 122-55 in rushing offense in the first half. Coconino’s mistakes were keeping the Eagles in the game. After halftime, the Panthers tightened the screws on both offense and defense. The Eagles went nowhere with their first possession. Anaya boomed a 52-yard punt, and Coconino has the ball at their 44. Ray Smith started taking over the game, running the ball six of Coconino’s eight plays, scoring from eleven yards out. After the conversion, the Panthers were up 14-7 midway through the third; though the score was still close, there was a definite sense that the Panthers had come out of the half meaning business. They had momentum, and the Eagles were flustered. The next series went the same way, with Flag High unable to do anything on offense, Anaya launching another long punt, and the Panthers driving. This time it was a 70-yard drive that ate up the remainder of the quarter, ending with another Smith run, this time from three yards out. The key play of the drive, however, was a third-and-ten from the Flag High 43; McKee completed a pass to Rick Shipley to keep the drive, and the Panther momentum, going. Ross’s third successful PAT put Coconino up 21-7 with just over ten minutes left in the game. Flag High was out of gas at that point. Their best drive the rest of the game took them to the Coconino 49. The Panthers kept the ball nearly the entire second half, running the ball, gobbling up yardage and time. Randy Watkins dove in from three yards out as time expired; the lone bright spot of the half for the Eagles was blocking Ross’s fourth extra point attempt, making the final score 27-7. Smith, to no one’s surprise, won the Coconino half of the Cromer Awards. Though not playing a perfect game, he did run the ball 32 times for 205 yards, and on defense he recovered a fumble that launched the Panthers’ first scoring drive. For the Eagles, Diaz won the Cromer. Kenny Gill finished with 33 yards rushing, 599 for the season. For most of the next decade-plus there would be at least one of the Gill brothers playing runningback for the Eagles. AT THE END OF THE DAY: Smith and the Panthers won the AA North and the right to defend their state title, this time against the Douglas Bulldogs. The Coconino faithful made the trip to McClintock High in Tempe, an estimated 4,500 strong packing the western bleachers. Ray Smith established himself as the man to beat right off the bat. On the second play from scrimmage, he broke into the clear for a 59-yard touchdown. He finished the day with 247 yards on 29 carries and two touchdowns; he also scored in the third quarter on a two-yard run. Between those scores and Dale McPhetridge picking up a fumble and racing 88 yards for a TD, the Panthers built a 21-0 lead that held into the fourth quarter. Douglas QB Tony Cortez Rose mustered two late scoring drives in the final minutes, pulling the Bulldogs to within a touchdown with 1:40 left in the game. Attempting an onside kick, the ball was nearly recovered by Douglas’s Paul Ochoa, but Coconino’s Richard Lucero jumped on it, sealing a 21-14 win and the Panthers’ third championship in seven years. Smith won most of Arizona’s awards for player of the year, finishing with 1,605 yards rushing. After graduation he stayed in Flagstaff and played for Northern Arizona. He was a vital member of the 1978 Lumberjacks, making key plays in preserving NAU’s first—and as of this writing, only—Big Sky Conference championship. He spent most of his adult life in Kingman, coaching the Bulldogs.